Ants can find their way into your home using incredibly small entrances. Ants are common and widespread pests with a nasty ability to get into even the most seemingly clean home. Once they're in your home it can be quite hard to get rid of them and they'll try to steal a share of any exposed food. Unfortunately, for every two you stomp five will take their place. Trying to get rid of ants without a plan, quality pest control solutions, and experience is like trying to drain a lake with a bucket. That's why you need an experienced pest control contractor with years of experience dealing with problems like yours. 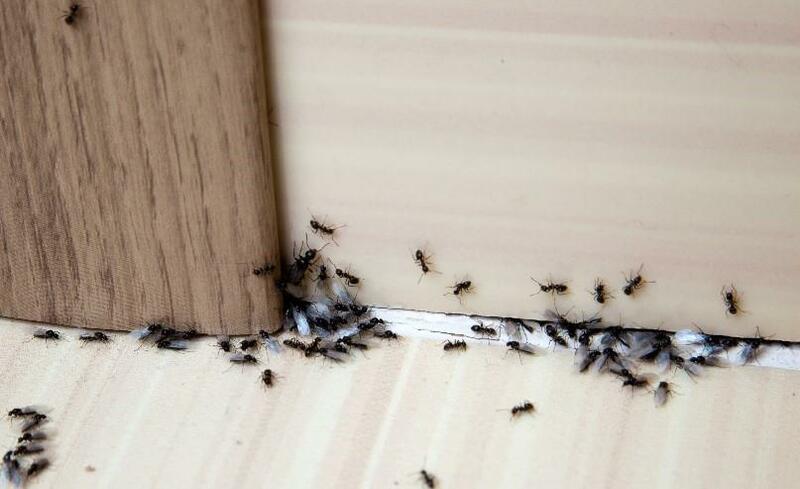 Luckily, you have just such a contractor in Connecticut Pest Elimination, Inc. With 27 years of experience, our team knows just how to solve your ant problem quickly and effectively. Give us a call at 1-844-882-0554 today or contact us online to schedule your free pest control cost estimate in Danbury, New Haven, Norwalk, Stamford, and throughout CT! What type of ants do I have in my home? There are actually over 12,000 different ant species worldwide, but you likely have either carpenter ants or the most common type of ant: pavement ants. These ants are dark brown to black in color and one reason pavement ants can be a major issue is that they are small, only 1/8 of an inch long. This lets them slip through cracks in sliding doors and other tiny openings. Since these spaces are so tiny it can be almost impossible to try and cover all of these holes, that is if you can even find them all. Pavement ants tend to nestle under driveways, dirt piles, sidewalks, and cracks in pavements, but they sometimes they can also be found under, logs, boards, stones, and patio blocks. They generally enter your home in search of food. Ants may swarm into buildings and nests which makes removal challenging. These swarms are mostly seen in the spring and summer and can be mistaken for termites. Flying ants and termite swarmers can look similar but there are some key differences. The ant's body is made up of three parts - the head, trunk and metasoma (or rear). Each ant has six legs that are attached to the trunk. Ants repel water due to their waxy bodies which enables them to float. In fact, ants can even live underwater for 24 hours because they don't have lungs! Ants are one of the world's strongest creatures relative to their size. They can carry up to 50 times their own body weight, which would be roughly the equivalent of a human lifting a mid-size van. They are also smart enough to work together to carry bigger objects. Ants don't have ears and some ants don't even have eyes! Ants feel vibrations in the ground instead and use that information to communicate and navigate. Ants are the longest living insects, they can live up to 30 years! Fire ants have caused up to 3 billion worth of damage a year. They are also known for their painful bite, which costs the U.S alone millions in veterinary and medical bills. They've also been known to cause damage to farmer's crops. Luckily, they are rarely found in Connecticut. Ants are found on every continent except Antarctica, despite the ant in the name. Do you have an ant problem in your home? The problem will only get worse the longer you ignore it. Get the help of an experienced ant extermination contractor. When you reach out to us at Connecticut Pest Elimination, Inc you can count on our team of pest control experts being there as quickly as possible. They'll examine your home to determine the exact nature of the problem and then devise the effective solution that you need. Contact us today or call 1-844-882-0554 to get started and schedule your free ant control estimate in Fairfield, Greenwich, Orange, Stratford, Hamden, Meriden, West Hartford, and nearby!